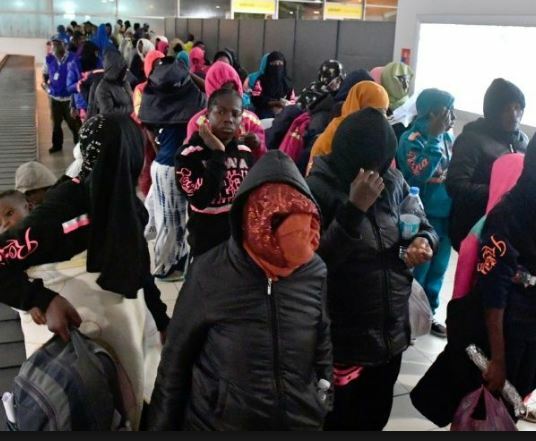 The International Organisation for Migration ( IOM ), a related organization of the United Nations ( UN ) on Thursday said it evacuated 127 Ghanaian illegal migrants from the volatile situation in Libya. Kojo Wilmot, a national officer of IOM said the aircraft carrying these migrants arrived Ghana around 10:15 p.m. on Wednesday local time. Wilmot said that there was one female and two minors among the rescued migrants. “We promote orderly migration, but these people were caught up in a volatile situation and were being held under various forms of inhumane treatment. “We, therefore, intervened to protect their human rights and return them home in a dignified and safe manner,” Wilmot explained. Majority of the returnees, the official said, were not from Accra, Ghana’s capital, but from Takoradi, 218 km west of the capital and Kumasi, 280 km north of the capital. Others are from Sunyani, 400 km north of the capital and other areas across the country. The IOM, therefore, provided them with a means of transportation back to their final destinations and would be supporting their re-integration into their communities. “Due to the inhumane conditions they were being kept, most of them would need psychosocial counselling. “We would also work together with government of Ghana and the EU mission in Ghana to support them with basic livelihood to help enhance their integration process,” he added. Wilmot explained that since these immigrants were mostly undocumented, who used illegal means to enter Libya and they were forced to do menial jobs, mostly “Malaga” (plastering buildings) but were usually handed over to the police when they pursue those, who hired them for payment. “One Ghanaian, who had painted a complete house went to the owner to receive payment, but instead the owner called the police, who came to arrest him. “While trying to escape from the police, the Ghanaian was knocked down by a vehicle,” the official said. He added that there was also sexual violence against the female migrants being held in Libyan detention camps, where they were captured and being kept. IOM has identified three more detention camps across Libya with at least 266 Ghanaians among the detainees. “We will work with all stakeholders to ensure safe and humane return of these Ghanaians and other sub-Saharan African migrants in these conditions. “Considering the conditions in Libya, most of them come to us voluntarily seeking help to return home. “The situation is dire and we invite all stakeholders to get their hands on deck to help in bringing back these migrants to their final destinations,” he indicated.